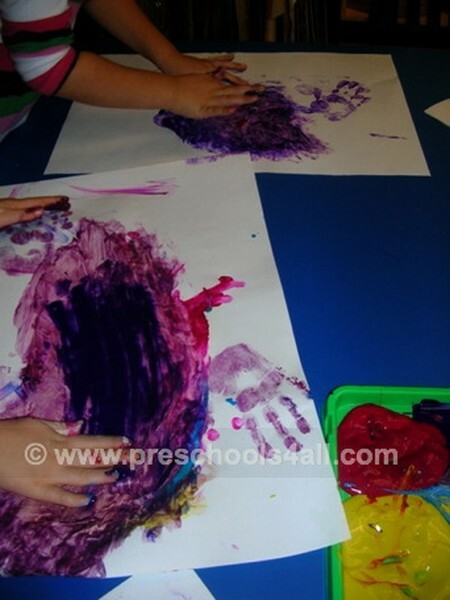 Creating homemade fingerpaint is an activity children enjoy - they love finding out how things are made. On this page you will find two recipes that work for us: flour based and corn starch based. 1. Mix flour and salt in the saucepan. 2. Add cold water and beat with the whisk (or a rotary beater) until the mixture becomes smooth. 3. Add the hot water and place the mixture to boil until it becomes thick. 4. Beat the mixture again to get a smooth texture. 5. 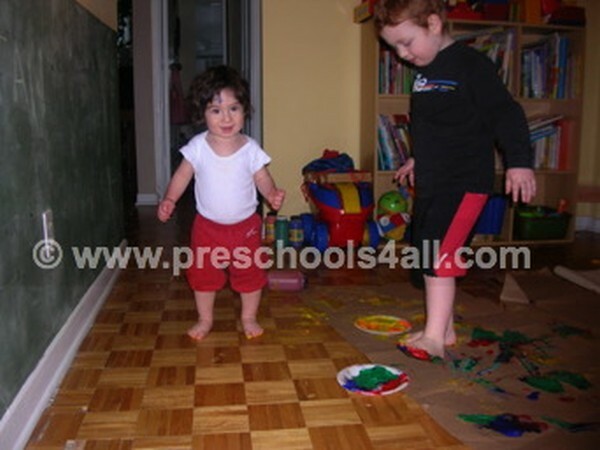 Divide the mixture to small containers and add food coloring or powdered tempera paint. 1. Mix sugar and cornstarch in the saucepan over low heat. 2. Add water slowly and continue stirring until the mixture is thick. 4. Divide the mixture to the number of portions you like (3 to 5) in small cups. 5. Add a couple of drops of food coloring to each mixture along with a drop of dishwashing detergent. 6. Stir and let cool. 1. Use your feet and dip them in the paint. 2. Create foot steps with your feet. 3. How about your toy animals? what kind of foot steps do they leave behind?